Here are four Google tips I use all the time. All these should be run from the primary Google search engine. I ran across a few of these a while back at Expert Village. If you run Firefox (you should be!) these can be huge time savers since all can be run from the Google search bar in the upper right corner of your browser saving a few steps. Google Calculator – You can run basic and complex computations from Google. I use this for basic multiplication and division all the time. For example, what if I want to know the answer to 240 times 37. Just type 240*37 into Google and hit enter and you’ll see this. It even handles conversions such as How many pints in a gallon or How many teaspoons in a tablespoon. I wonder how many feet are in 26 miles? Woah! Google Dictionary – There’s no need to find an online dictionary when you can find word definitions right from Google. For example, I keep seeing the word, schadenfreude, pop up on a few blogs but I have no idea what it means. Just type define:schadenfreude into Google and it spits out the definition. Very cool! By the way, what’s a Doppelganger? Google Flight & Weather Status– Two tips for the price of one. Sometimes I need to find flight information but don’t want to track it down from the airline or travel site where I may have to login. All I need to have are the flight number and the airline. So if I’m searching for the status of Delta flight 1410 just type delta 1410 into Google and the first result will link to the flight status I’m after. Google puts a small picture of an airplane next to these results as a visual cue. Coolness. You can also find the current weather conditions by typing weather “city” such as weather seattle and you’ll be presented with this update which includes a 5-day forecast. I wonder what the weather is like in Frankfurt, Germany? Google Movie Times – This my favorite Google tip! I use this all the time. All you need are the movie’s title and the zip code of the area where you’d like to see it. Say I want to know when the movie, Horton Hears a Who, is showing in the Auburn WA area. Just type horton hears a who 98092 and here are the results. 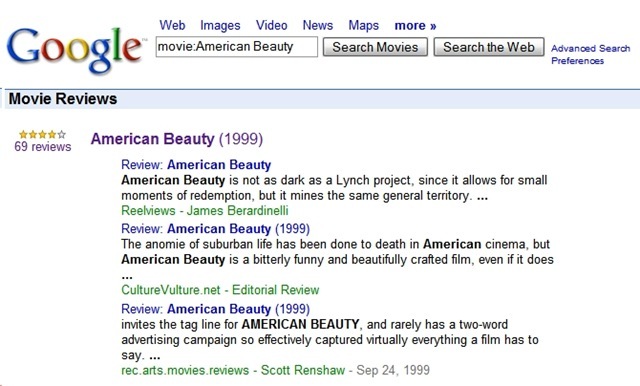 Notice the little movie reel out to the left of the results. If you want to see all theaters in your extended area where the movie is playing just click on the More theaters link. But what if I want to read reviews of my favorite movie, American Beauty? Easy enough. Next Post How’s My Driving? GREAT tips – didn’t know about any of them! Thanks so much for featuring Expert Village tips here on your blog. We do have a full series on Google search tips (http://www.expertvillage.com/video-series/2465_google-search.htm) but we also have new Google series up. I hope some of these are useful to you also!